Is there a better alternative to Simple Issue Tracker? Is Simple Issue Tracker really the best app in Reference category? Will Simple Issue Tracker work good on macOS 10.13.4? Simple Issue Tracker offers indie/solo developers a convenient, simple and efficient tool to organize and manage their product/project related issues, like bugs, features, tasks, enhancements...you name it. 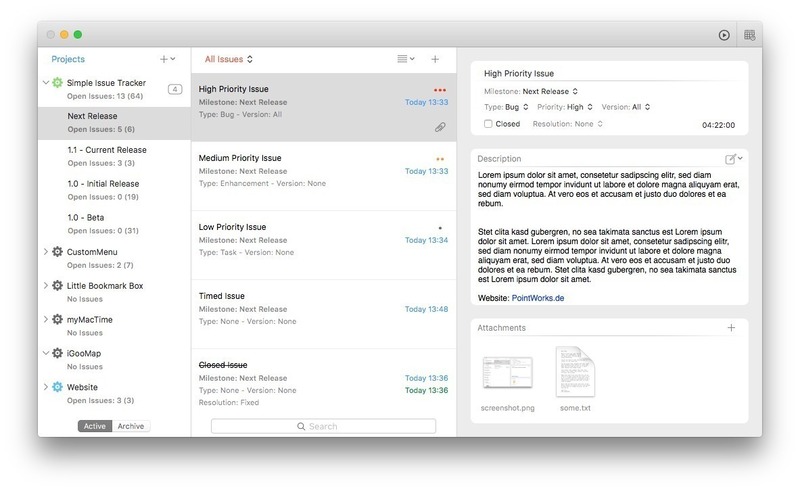 Simple - The easy to use, intuitive and native user interface makes it a snap to manage your projects, milestones and issues. 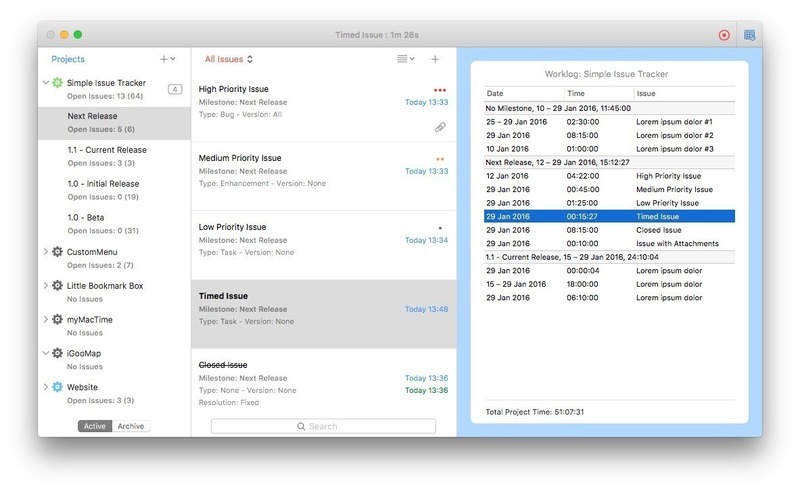 Work Log - Easily capture the time spend resolving a particular issue. The overview shows you the total project time, seperated by milestone and issue. Simple Issue Tracker needs a review. Be the first to review this app and get the discussion started! Simple Issue Tracker needs a rating. Be the first to rate this app and get the discussion started! Stand-alone - Neither a network connection nor any complicated installations are required. You can simply use S.I.T. "out of the box". Organize - Due to the clean GUI and drag-and-drop support, Simple Issue Tracker makes it pretty simple to keep issues organized by projects and milestones. Customize - By customizing issue types and resolutions, or by using your own templates for issue descriptions, S.I.T. can be easily configured to suite your needs. Sync - S.I.T. offers convenient synchronization via Dropbox, for keeping your entire Simple Issue Tracker library in sync across your Macs. Customizable types, e.g., "Bug", "Feature", "Task" etc.